This article, published in the National Post, suggests that a high protein diet is as risky to human health as smoking 20 cigarettes a day but behind the headlines is a much subtler message. The original research study, published in Cell Metabolism, found that adults 50 – 65 had a 74% increased risk of dying from all causes and three times the risk of dying from cancer when consuming a diet that provides 20% of its calories from protein. 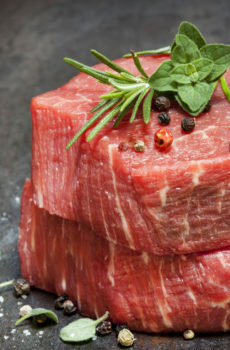 The statistical analysis suggested that most of the risk of protein intake came from animal protein. No protective effect of plant protein was found – but high plant protein intake did not increase risk of dying. This is potentially damning news, as this level of protein intake is quite common in North America; however, the study details make the findings somewhat less damning. Adults over 65 appeared to be helped by higher protein intake, with a 28% reduction in risk of dying by eating 20% of daily calories from protein. In addition, while the National Post article claims that thousands of adults were tracked for years, in fact, the dietary information came from just a single recall of food intake over 24 hours. Do you eat the same way now as you did ten years ago? Yearly food recalls would have provided far stronger evidence of a link. In our opinion, this study strengthens the evidence that our standard Westernized diet of high animal protein and few fresh plant foods may not be the best choice for long-term health. However, our food choices take place within the context of an overall diet. If you enjoy eating meat and dairy, make them an accompaniment – not the main course – and enjoy more whole plant foods for better health. The original study was published in Cell Metabolism.